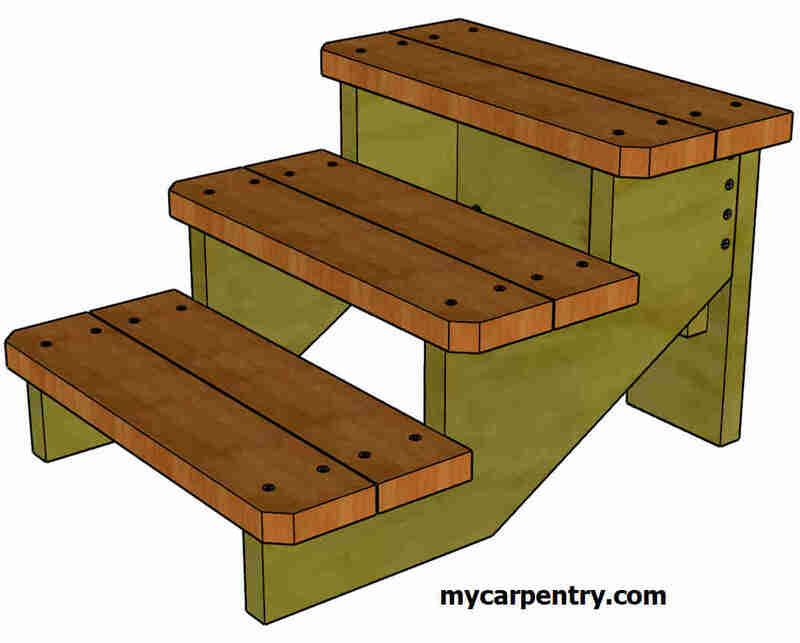 I built these custom stairs because I needed some free-standing stairs for my travel trailer, but I also wanted to demonstrate stringer calculation using mycarpentry.com's Stair Calculator, and how I used SketchUp Pro to create 3D drawings of my stairs before starting construction. The built-in two-step folding stairs attached to our travel trailer provide access to the RV via three steps (9.5, 6.5, and 9.5 inches), totaling 25.5 inches. This works fine when we are RV camping in a state park for a weekend, but when we are docked at our lake property on level ground, I wanted some custom stairs that were a little easier to climb. 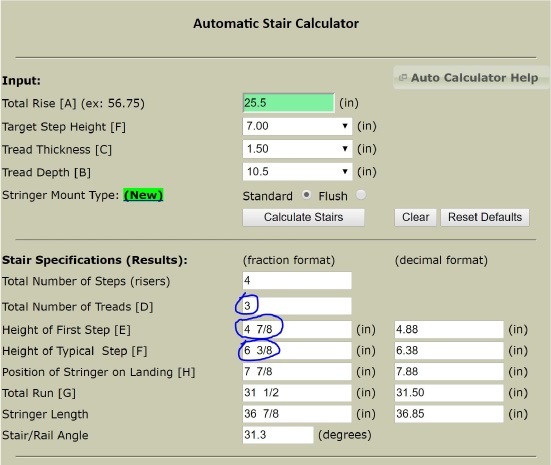 I used the Stair Calculator on myCarpentry.com to determine the rise and run and the number of steps that I needed to design my stairs. I entered 25.5 inches (the height from the ground to the trailer's threshold) into the Total Rise field of the Automatic Stair Calculator, and left all other input fields at their default values, then clicked the Calculate Stairs button. The result was four equal steps at 6 3/8 inches each. 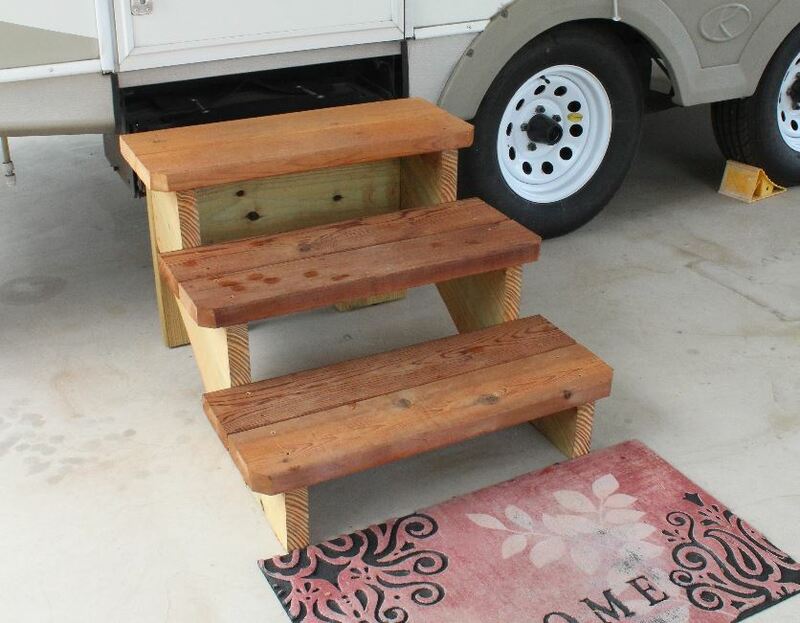 Since the stairs would not be attached to my travel trailer, my stair design became a free-standing wooden step unit with three 6 3/8-inch high steps (totaling 19 1/8 inches). Note: The last 6 3/8-inch step up into the doorway of the travel trailer completes the 25 1/2-inch Total Rise calculation. When laying out the stringer (above), the height of the first step is always the Typical Step Height minus the Tread Thickness (6 3/8 - 1 1/2 = 4 7/8) so that when treads are added, the first step equals the height of the other steps. On this particular stair stringer design, I also subtracted 1 1/2 inches from the back of the top step's Tread Depth, so that when I added the 1 1/2-inch thick back supports to the stringers, the total Tread Depth would equal the designed Tread Depth (10 1/2 inches). 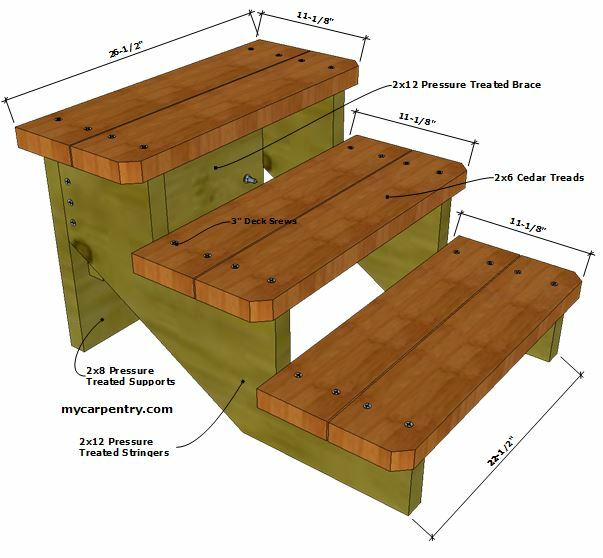 Once I determined the specifics of my stair design, I used Sketchup Pro to draw the stringers, back supports, and treads. Then, I assembled the components into a 3D image that I can twist and turn and flip to see every angle. This helps to visualize the finished product, make any changes that might be necessary, and to create a detailed materials list. The list of materials below shows the actual sizes of lumber that I needed in order to build my custom stairs. I used this list to determine the nominal lengths of lumber I needed to purchase from the lumber yard. 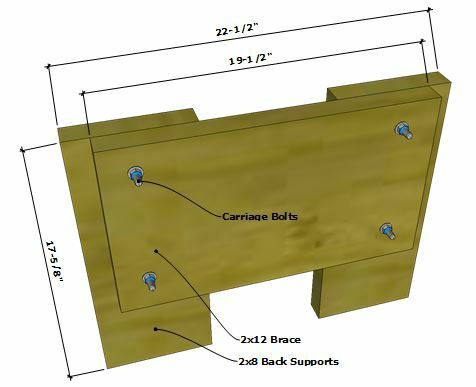 First, screw and bolt the 2x12 brace onto the two 2x8 back supports, letting the back supports extend 1 1/2 inches past the ends of the 2x12 brace (as shown in the drawings) using the 3-inch deck screws and 1/4-inch x 3 1/2-inch carriage bolts. 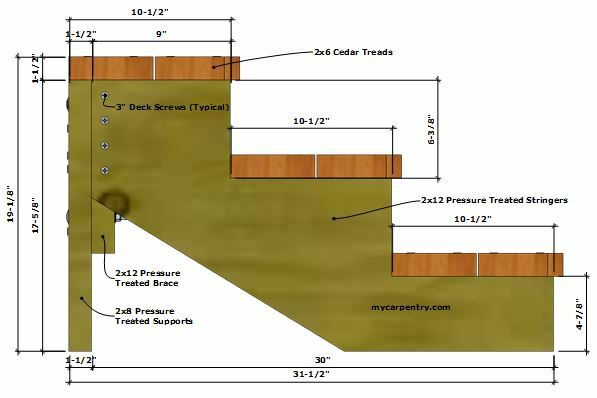 Next, cut the stringers to the design specifications, obtained from the Stair Calculator, and screw them into the ends of the brace using four 3-inch deck screws on each side. 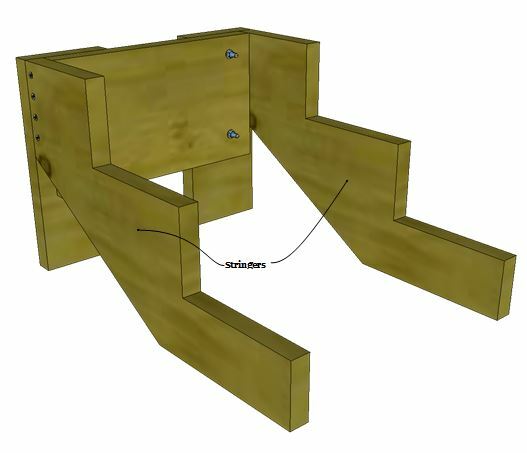 Make sure the two stringers are square with the back support structure, and add three additional screws from the back supports into the ends of the stringers (see Back View diagram below). Cut the six 26 1/2-inch long 2x6 cedar treads. Check the stringer/support structure for square (once more) and ensure that the lower ends of the stringers are the same distance apart as upper ends that are attached to each end of the brace. Attach the cedar treads using two 3-inch deck screws at each end, letting them hang over the stringers approximately two inches on each side. Once assembled, I added a chamfer to the front treads of each step. This wasn't a requirement, but I thought it added a little style to these basic custom stairs. As a final step, I sealed the completed stairs with a cedar stain/sealer. The steps worked better than expected. Not only did they make getting in and out of our travel trailer easier, the new custom stairs made our house on wheels feel a little more like home.